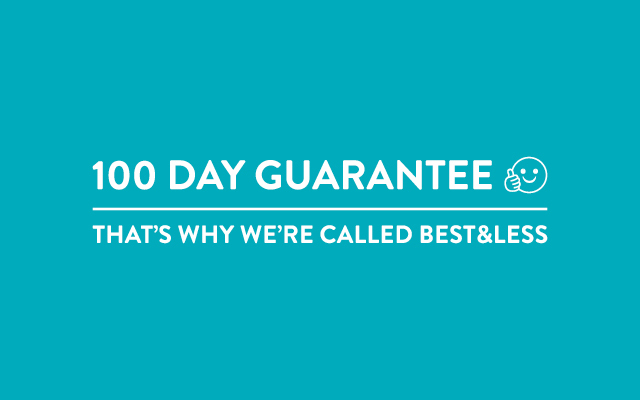 Our 100 Day Quality Guarantee means that you can gain a refund or exchange should you not be satisfied with the quality of the product within 100 days of purchase. To read more about our Quality Story, click here. This incredible returns policy is in addition to your rights under the Australian Consumer Law which we will always stand by. Please note if you have a quality concern with your purchase after 100 days, simply contact our Customer Service Team on 1300 135 766 for assistance. We do everything possible to ensure that our products are of the highest standard possible. When you see our Quality Guarantee you can be assured that your new purchase won’t fall apart after a few washes. It also means the products have been tested against stretching, shrinking and pilling and that they won’t lose their colour, wash after wash, after wash. However if something is faulty, or incorrectly described or different from the picture shown online, we will happily either refund the purchase price (and delivery charges if applicable*) or provide a replacement product according to our legal obligations and Returns Policy. *Delivery charges will only be refunded if there are no other items listed on the original invoice of the product you are returning. If something isn’t quite right or you just change your mind, we are happy to accept a return. If you change your mind about the products you have purchased from us, we can refund the purchase price or exchange those products subject to our Returns Policy. If you request a refund, the purchase price (excluding delivery charges for online purchases where you are not returning all products ordered) will be refunded to you using the original payment method, once we have received the returned item and confirmed that it meets conditions above. Item(s) must be returned within 100 days of purchase, together with Proof of Purchase, so make sure you bring it in or post it back to us in good time. Item(s) must be unworn, unwashed, or otherwise unused with all original tags/labels attached. Returns for swimwear will only be accepted if the protective gusset and labelling have not been removed. Underwear and earrings cannot be returned or exchanged due to hygiene reasons. If you request a refund, the purchase price (excluding delivery charges for online) will be refunded to you using the original payment method, once we have received the returned item and confirmed that it meets conditions above. Best&Less is committed to protecting your privacy. You will be asked for information that is relevant to your return or to satisfy legislative requirements. If you do not provide this information then we may be unable to process your return. When returning merchandise with adequate proof of purchase, you will be asked for your signature as authorisation of the return transaction. If Best&Less agrees to the return without adequate proof of purchase, you will be asked to provide photo identification containing your full name, signature and expiration date, so that your name and signature can be verified. This information may be accessed by authorised Best&Less team members for fraud investigations and fraud protection activities. Information collected on returns slips will be securely stored and may be used for the purposes of research and analysis and may be disclosed to Government departments upon request as required by law and to related body corporates of Best&Less. If you wish to access your personal information please contact Customer Service Team on 1300 135 766 or privacy@pepkor.com.au.